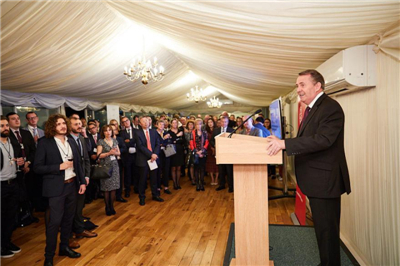 On October 10, 2018, Minister Ma Hui attended and addressed the WPP Reception of the Brandz Top 100 Most Valuable Chinese Brands 2018 at the Houses of Parliament. About 150 people were present, including the Rt Hon. Liam Fox MP FRCGP, Secretary of State for International Trade, the Rt Hon. Lord Bates PC, Minister of State at the Department for International Development, Sir Geoffrey Clifton-Brown MP FRICS, Chair of the APPG for International Trade and Investment and Conservative Party Board Member, Roberto Quarta, Chairman of the WPP and other representatives from British Government, Parliament, business and media sectors as well as representatives from Alibaba Group, Fosun, Uxin, and other Chinese companies. Minister Ma said in his speech that the Chinese government attaches great importance to brand development and brand economy and encourages and supports Chinese companies to be innovative to improve product quality and develop valuable brands. It aims to shift development priorities from “Made in China” to “Created in China”, from “Chinese Speed” to “Chinese Quality”, and from “Chinese Products” to “Chinese Brands”, which will help to accelerate the upgrading of supply and consumption structure, achieve high-quality economic development, and meet the needs of the Chinese people for a better life. 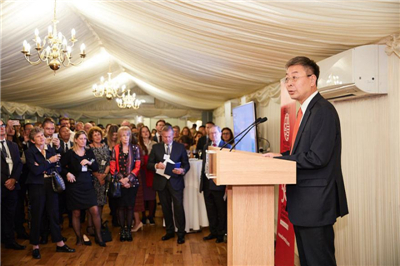 WPP’s joint effort with Chinese companies to promote Chinese brands is a good example of China-UK cooperation that meets China’s needs in building strong brands and promoting industrial upgrading. Ma extended his warm congratulations to the Chinese companies on the list and hoped that they would continue to work hard to improve their brands and provide higher-quality products and services for consumers in the world. Noting that China will continue to deepen reform and expand opening up, develop friendly relations, and pursue win-win results with other countries, Minister Ma encouraged the business community to grasp the great opportunities of China’s opening up, tap the potential of Belt and Road cooperation through enhanced exchanges, mutual learning and cooperation, share China’s development fruits, and work together to promote world peace and stability. 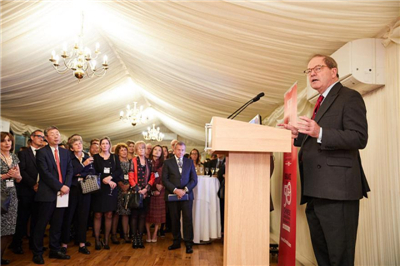 Secretary Fox said that China has increasingly become an important trading partner of the UK. The economic relations between the two countries have brought and will continue to bring tangible benefits to the two peoples of the two countries. From 2010 to 2016, British export to China increased by 60%. As a result, China became the UK’s third largest trading partner after the EU and North America. China and the UK share great potential in expanding trade and investment. Chinese people are fond of British brands. Chinese companies are strong in innovation and Chinese brands are growing in value. The UK is strong in advertising service and brand promotion. The cooperation of the two countries would face enormous opportunities. Fox said that he has visited China four times this year, and will participate in the first China International Import Expo with HRH The Duke of York. In March next year, the UK will also send a delegation to participate in the Shanghai International Advertising Festival 2018. Clifton-Brown said that, after Brexit in 2019, the UK will actively expand opportunities for global trade and economic cooperation. China will be one of the priorities. The Belt and Road Initiative has brought great opportunities for deepening China-UK cooperation in various fields. He hoped that the British companies in the service industry would seize the opportunities and make full use of their advantages in the fields of legal services, consultancy and project management to join Chinese companies in exploring global market and achieve joint development. Quarta said that WPP is the first foreign communication service company to operate in China, and China is the first country for WPP to publish its national report of the Brandz Top 100 Most Valuable Brands. The Chinese Dream of achieving the great rejuvenation of the Chinese nation proposed by President Xi Jinping promises a better life for the Chinese people and provides great opportunities for deepening cooperation between the UK and China. 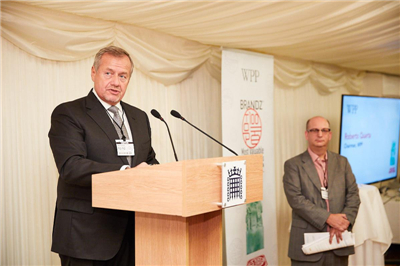 WPP stands ready to continue to help Chinese companies to explore the British market, create international brands and assist British companies in deepening cooperation with China after Brexit. WPP plc, listed on NASDAQ, with its headquarter in London, is the largest advertising and public relations company in the world. It has offices in 112 countries and areas, with over 130,000 employees. In 2017, its income reached $19.7 bn. It is the eighth time that WPP has released the report of the BrandZ Top 100 Most Valuable Chinese Brands.